The Bonne Terre Mine is located about an hour south of St. Louis in San Francois County, which is the historic mining region of Missouri. 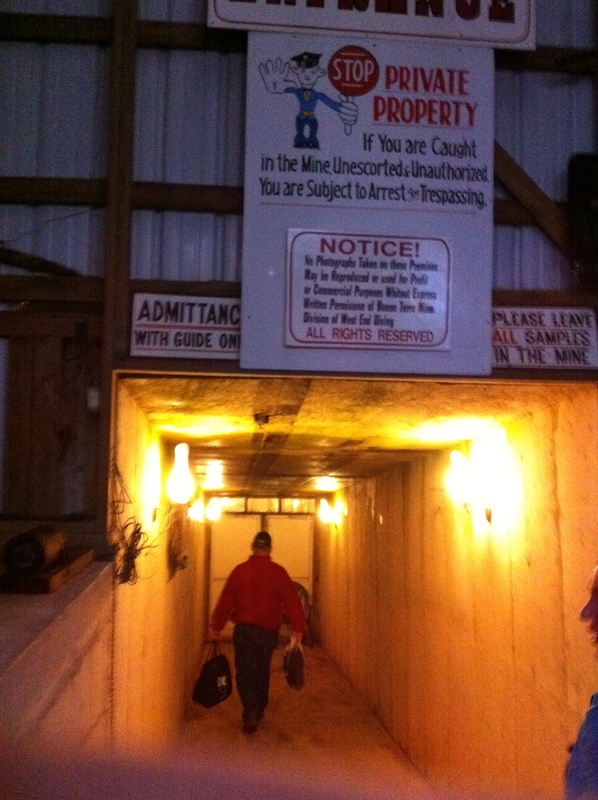 The mine was once the largest lead mine in the world, accounting for 70% of all the lead mined in the United States. By using a water pumping system, the mine was able to go well below the water table into the earth. After the mine closed in the 1940’s, water filled up the lower 3 levels of the 5-level mine. Now it is possible to “deep earth dive” 150 feet below the ground. Due to this unusual situation of a giant lake underneath the ground, I only needed to get a basic scuba certification and did not need the “mine diving” endorsement. This bucket list item took considerably more work than anything else on the list because I was not scuba certified. So over winter break, while on vacation in Florida with my family, got certified. The process took 6 hours of online coursework, 1 day in the pool, and 2 days in the ocean. 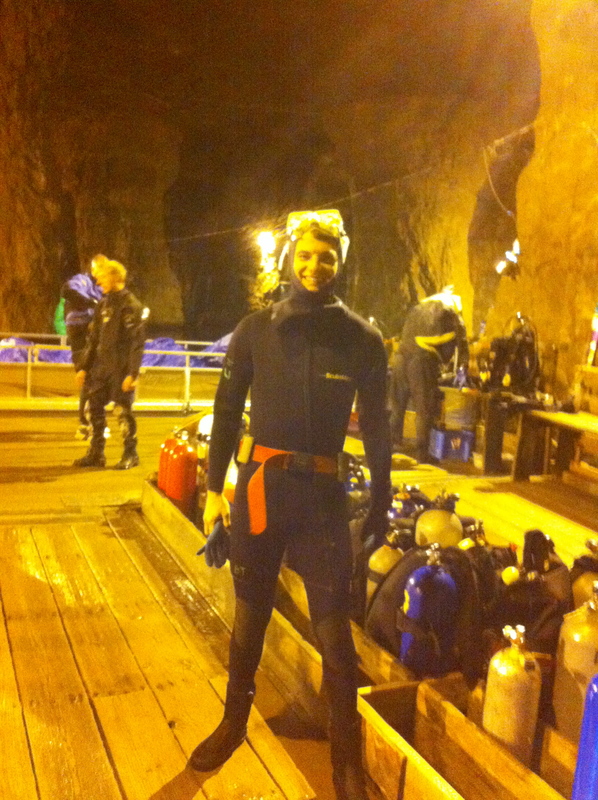 Once my certification card got mailed to me in mid-January, I made the appointment to dive in the mine. The mine has 22 guided scuba trails that must be completed in order. As a novice scuba diver, I was forced to dive on trails 1, 2, and 4 (yeah they messed up with the numbering). These trails were only run on Saturdays with the first dive starting at 8 AM with check-in at 6:30 AM. I first checked in and got my rental equipment before meeting up with the rest of the group before walking down into the mine. 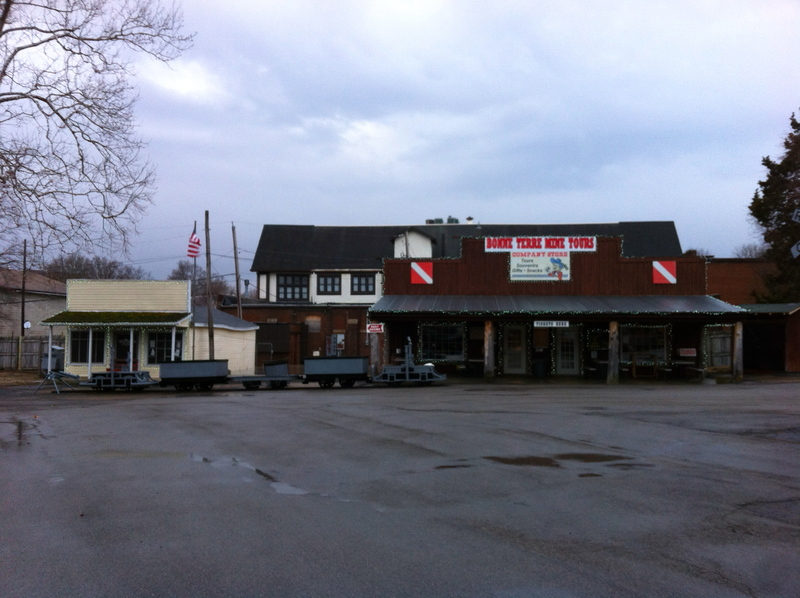 The entrance to the mine is a small red shack about 20 feet from the dive shop. In the shack, there was a staircase that went down into the mine, which is truly another world. The first things I noticed when descending into the mine were the 65-degree temperature and the humidity from all the water. 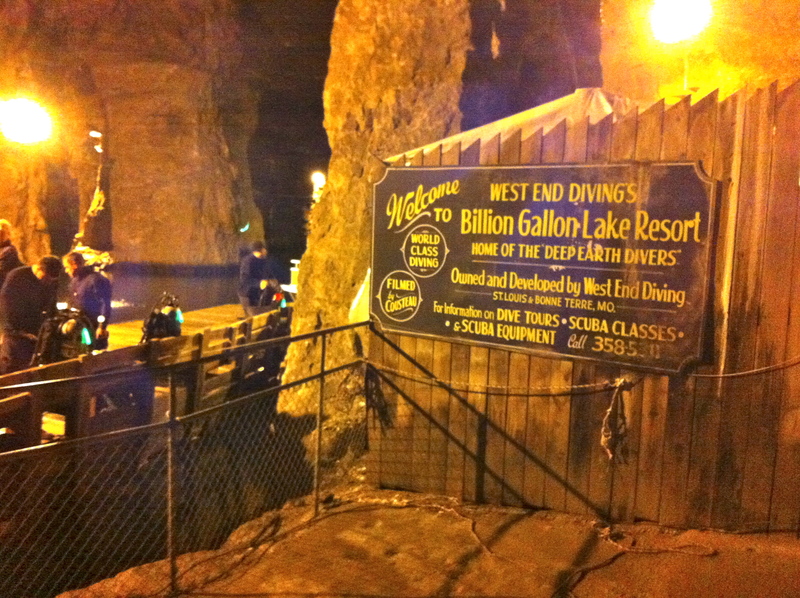 We descended 150 vertical feet below the surface to the diving platform. In addition to the air, the water was also 65 degrees, so most people wore dry suits. Unfortunately, I rented a wetsuit, so I had to deal with the cold water. Unlike most dive resorts, where you dive in pairs, the mine dives were all in large groups lead by 2-3 guides. My group had 7 people including 4 firefighters from Green Bay, Wisconsin and 2 friends from London, Ontario, Canada. Everyone except for me drove 8+ hours to get to the site. Once the group connected all our air tanks and got completely suited up, we were ready to dive. Jumping into the water, we immediately entered another world. Although the ceilings and pillars in the mine were only 50 feet tall above the water, the walls actually extended 100-250 feet underwater. The pillars were sequoia sized. As we swam through the slot canyons, I felt like I was flying through the Narrows of Zion National Park. Scuba diving feels like flying. Oftentimes when swimming over a large drop off, I would hold my arms out like a bird. For the first dive, Trail 1, we explored the pillars and swam underneath a giant 50 ft. underwater archway that rivaled those in Arches National Park. While diving, I felt a constant feeling of nostalgia for all the amazing rock formations and canyon on the American Southwest that looked so strangely similar to the mine. We also played with mine carts and were able to pick up the pickaxes left over from the mining days. For the second dive, Trail 2, we explored one of the many underwater canyons in the mine and swam through narrow tunnels while watching the bubbles move along the top like mercury in a thermometer. We also stood on top of large cliffs and “BASE jumped” off them with no fear. While for most dives, we stayed around 34-40 feet below the surface, on Trail 2, we BASE jumped down to our greatest depth of 95 feet below the surface. At one spot on the trail, we passed by a workbench used by miners and saw a newspaper left there from 1940. I was actually able to read the article. The third dive, Trail 4, was by far the most interesting. Because the trail mostly went through tunnels in the 4th level of the mine, we were in very low light situations which made the scenery much more dramatic. The giant columns loomed eerily in the distance. About 40 minutes into the dive, we reached “The Structure”, a giant 250 ft. tall elevator used to take all the ore taken out of the mine. After playing around the structure, we reached our first air check. As a novice diver, I was not an expert at conserving air, so I had to surface (the cut off point is 500 PSI which for me is about 10 minutes of air at 40 ft. below the surface). However, since we were so far from the dock, they made me go to the surface alone and wait for everyone else. For about another 20 minutes, I floated alone surrounded by nothing but dark columns. It felt creepy. Following everyone back to the dock was simple- I just swam to the air bubbles and occasionally looked underwater to stay in visual contact with the rest of the group. Each dive lasted about an hour, which is very long for a scuba dive. So after swimming for 3 hours in the cold water, I was exhausted and definitely ready to be done diving for the day. That said, the day diving was one of my favorite days in all of college. Without a doubt, every St. Louisan should visit the Bonne Terre Mine to get a glimpse into a fantastic world that is so different from anything else in the region.